The draw for this year's competition was made at the Junior Committee meeting on 5th February 2019. 7 clubs entered the competition. These (in effect Quarter Final) matches to be played by 30th June 2019. For report see Junior News page. 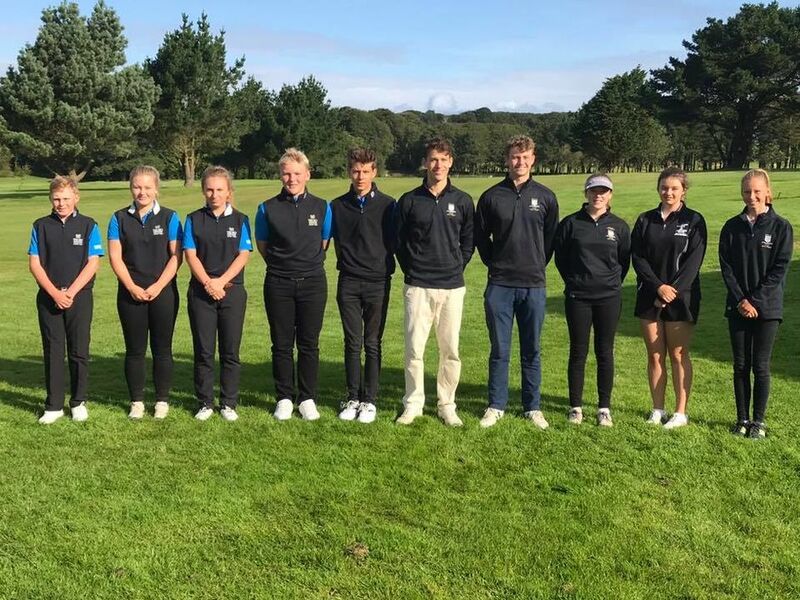 Truro Juniors yesterday claimed victory in the 2017 Brian Gripe Junior Summer Knockout Final defeating West Cornwall at Tehidy Park GC 4.5 - 0.5. In doing so they reversed the result of last years final where the honours had gone to the West Cornwall club. The two teams are pictured below just before they set out in the 36 hole final. L to R: (Truro) Thomas Stephens, Laura Andrew, Olivia Trewelha, Josh Hodge, Ricardo Sanchez, (West Cornwall) Finn Rule, Bradley Barnes, Casey Olds, Hannah Body and Kira Barnes. 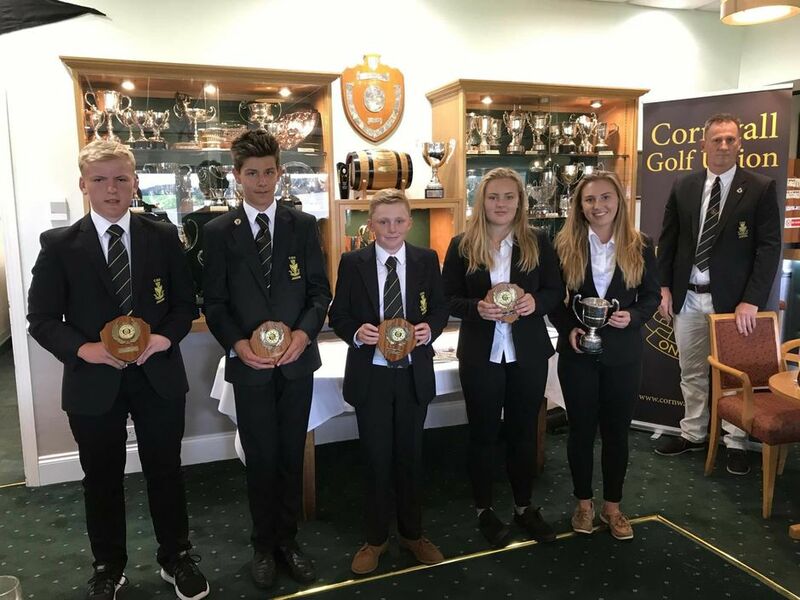 It was a good day for Truro’s Juniors as they played the final of the Brian Gripe Scratch Summer Knockout at Tehidy Golf Club against West Cornwall. The morning 18 holes saw some incredible golf from both teams, but it was Truro that built a solid foundation as going into lunch they were up in all five matches. At the front end CLCGA County Champion Laura Andrew was 2 up on County Junior Captain Bradley Barnes. Behind Laura, Olivia Trewelha was 2 up on Finn Rule, whilst Ricardo Sanches had a 3 hole lead over Kira Barnes. Completing the picture, Thomas Stephens was 3 up on Casey Olds awhilst Josh Hodge had raced to a 5 hole advantage over Hannah Body. Everyone though was conscious of the fact there were a further 18 holes to play. After lunch, the wind picked up but it didn’t seem to have an impact on the quality of golf being played. The lead pairing of Barnes and Laura Andrew were all square on the 31st hole when the overall result was confirmed and they agreed to an honourable half. That was the only half though as Truro consolidated their halfway lead and turned it into a comprehensive victory. Trewhela beat Rule 7&6, Ricardo Sanchez beat Kira Barnes 6&5, Stephens ploughed on to a 9&8 win over Olds and Hodge despatched Body 8&7. The final had been played in a tremendous spirit and both teams sat down together afterwards to tuck into some well deserved food before Junior Vice President Simon Ferguson – Smith carried out the presentation of prizes congratulating both teams on the high quality of golf played. Host club Tehidy Park were thanked for staging the final and the hospitality surrounding it and the arrangements. Other Truro players who played earlier rounds of the competition were not forgotten and these included Emily Wilson, Jack Andrew and Cameron Gurd. Gurd was unavailable for the final as he is currently at The Manchester Golf Club participating in the England Golf U14 Open Amateur Strokeplay Championship for the Reid Trophy, which commences tomorrow. We wish him well! The Truro team are pictured below with their prizes - and don't they look smart! Simon Ferguson-Smith looks on. L to R: Josh Hodge, Ricardo Sanchez, Thomas Stephens, Laura Andrew & Olivia Trewelha.